Our company employs a large team of qualified security consultants and service engineers to make sure your electric gate is secure, effective and most importantly — safe. Our team has worked in a wide variety of operating environments. 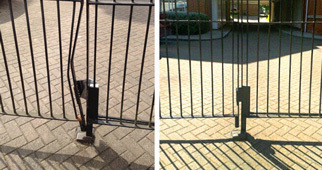 We have performed residential, industrial and commercial automatic gate repairs in Essex. If your electric gate cannot be repaired, we can install a new electric gate with cutting edge security technology and safety features. We have been installing electric gates in Essex for years and understand the unique security concerns in this location. Our electric gates will deter intruders while keeping the occupants of your property safe from harm! Why we carry out Electric Gate repairs in Essex? According to UK crime statistics, there are more than 1,000 burglaries and more than 2,000 violent crimes occurring in Essex each month.There has been a steady increase in crime levels since 2015, which has concerned many business owners operating in the area. The incidences of anti-social behaviour and trespass are also increasing quickly, which highlights the importance of having an electric security gate in Essex. One of the most common outcomes of vandalism is damage to security infrastructure, so it’s always important to ensure your electric gate is working correctly. Having a well-designed and correctly maintained security gate will give you peace of mind — you can rest assured, knowing that the occupants of the building and your property are both safe. We use CAMESAFE trained installers who have the experience and skills necessary to perform automatic gate repairs in Essex. They can integrate your electric gate with any other security infrastructure you have including CCTV, access control systems and pressure sensors. Over the years, 1st Choice Security has performed hundreds of electric gate repairs in Essex. We have visited almost every town including Colchester, Billericay, Saffron Walden, Frinton-on-Sea, Wickford, Rayleigh, Epping, Harlow, Coggeshall, and Brentwood. Our company is able to supply complete system upgrades, which can take your existing gate and greatly improve its functionality, performance, and security. We work with all security gate designs including swing gates, sliding gates, and driveway gates. Our gate upgrades can be integrated with any other security infrastructure that you have including access systems, alarms, and CCTV systems. 1st Choice Security Systems has a surveying service which identifies any potential security issues before planning an electric gate installation that works perfectly for your property. We have experience designing electric gates in Essex for factories, shops, offices, and private residences.Our security consultants can offer you obligation-free advice on how you can secure your property using an electric gate.